Many of you are probably familiar with Hyland’s Homeopathic products, especially if you have ever had a teething child! I’ve heard from many parents who swear by the teething tablets (including myself) to help alleviate the pain and fussiness associated with teething. Did you know that Hyland’s also makes teething gel as well? 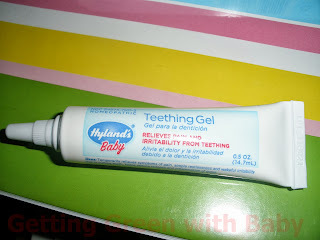 Hyland’s was kind enough to send us some of their teething gel to try out. It seems like Myka has been teething endlessly for the past several months. While I’m glad she’s not a “drooler” like a lot of babies are while teething, it seems like she has gotten increasingly fussier about the whole business as time goes on. Since the teething tablets work magic, I was excited to try out the gel! There was a short time a month or so ago when Myka decided she didn’t want to open up for the teething tablets any more. 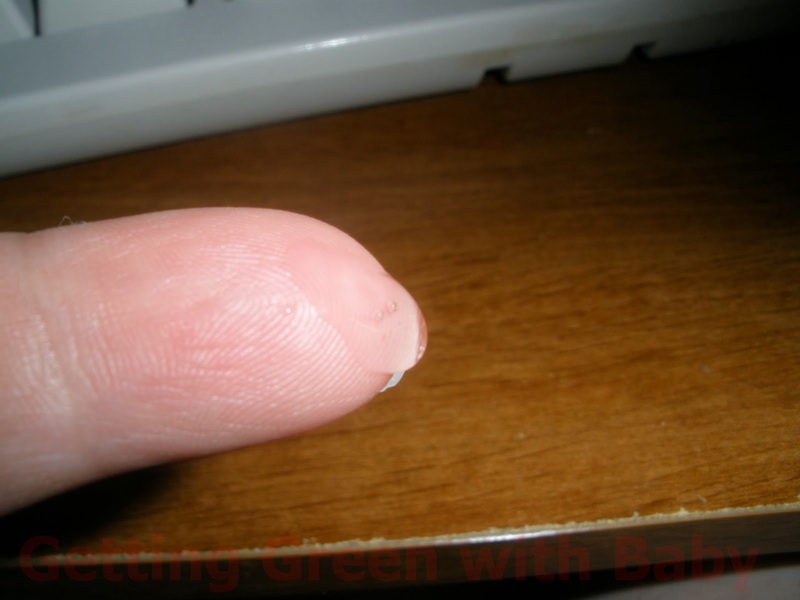 This was another reason I was eager to try out the gel. Maybe she’d open up for that, right? Ha! As per usual, the little turd decided to turn on me again and let’s just say she hasn’t been the most cooperative test subject! I swear I’m not going to go on and on about Myka’s peculiarities the whole time, but I’m just trying to be upfront in case you have stubborn children too! M is also different from most kids her age in that she doesn’t stick everything in sight in her mouth. This also made it difficult to get the gel on her gums, but we found several “tricks” that seem to work. So, with all of that out of the way, how effective is the teething gel? I’d say it works pretty well so long as you can actually get it covered well on their gums. ;) (Most of you shouldn’t have a problem with this since most 11 month olds stick everything in their mouth, right?) It definitely helps calm M down enough to go to sleep, which makes sense and also states on the directions may happen since their pain is being alleviated. I think Myka finally realizes that it will help her gums and teeth feel better because I’ve gotten her to “open up” the last two times I’ve given it to her. It definitely helps getting it evenly distributed when the little one cooperates! 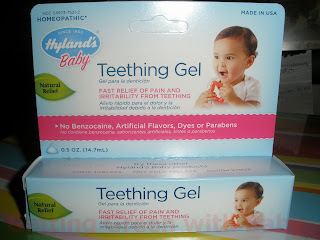 One of my favorite things about Hyland’s Teething Gel is that other than being artificial flavor, dye, and paraben free, it also contains no benzocaine! While I will admit I don’t mind using products containing benzocaine on myself, I’d rather not use them on my young daughter. She always likes to stick her tongue out when I am getting ready to rub some gel on her gums, so I like that Hyland’s is not going to make her tongue numb! Also, as you guys may and should well know by now, I am an avid ingredient checker. That’s why I like that on the back of the box not only are the active ingredients listed as usual, but Hyland’s also put what each one’s purpose is! Maybe I’m just paranoid or something, but I think it’s nice to be able to see what their purpose is instead of wondering, “What the heck is THAT for?” or whether it is just an unnecessary ingredient, which a lot of other companies like to use.